I was reading this totally hilarious article the other day in the Star (it isn't online, otherwise I'd post it), and it seems most American authors are publicity whores too! The reason? "You've worked incredibly hard on this book," says the article's author. "It's only natural you want to see it do well." I wonder if I'll be this way about my 2nd book. haha... I wonder if No. 2 would work. Sounds like something I'd do if I ahd a book out. btw, Lydia posted a link of the article (not at the Star though) on her blog. Dear Ted, as you know, I'm very slowlah....very busy workingloh....but I've also read Dean Koontz talk about posting Amazon.com fake reviews. In fact, some of them post negative reviews about a rival author's book on Amazon! Congrats on being on the bestseller rack in Kino! Dear Lydia, let's make a pact. I post good reviews for you and you post good ones for me! Anyway, I'm sure Kino's bestseller rack doesn't mean anything...they put books there they want to push. See, Lynette....your hard work's paying off now. So happy for you and yes, FYI, you need to keep tab when your title hits the best-seller list. When mine went up the list, I didn't know about it until someone told me they chanced upon it in The Sun and I scrambled to search for the dated papers. That was for the Kino best-seller listing (published in The Sun, every WED). When it went up at Popular, also I didn't know until Lydia saw it and I went to Popular's website to down load it later. See, Lynette, bookstores also don't tell you when it hits best-seller but if you've helpful friends, it helps. And believe me, the solid proofs are important. Reporters asked for them as they don't take by word of mouth that yours' a best-seller until it is really listed. But after you get your listing, you belanja us and celebrate, can? Yvonne, yours is a true bestseller. No doubt about it. I actually doubt I will ever hit the bestseller charts in any week because it's Malaysian English fiction, and this genre is not known to hit the bestseller charts. I however may hit bestseller status IF I sell more than 1000 copies in Malaysia alone. That's quite achievable, I think. Do you know how many books you sold in Kino the week you hit No.2? And MPH as well? They go weekly, right? Because Rodney tells me Da Vinci Code sells by the thousands. Yours is a success story everyone can only dream of and hope to emulate. 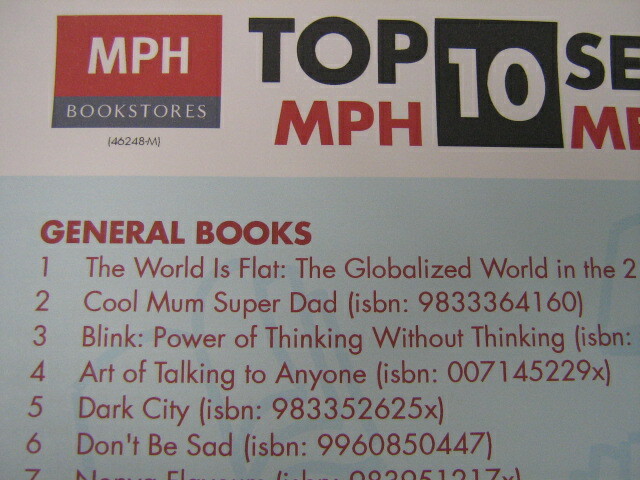 BTW, where is it in MPH 1 Utama that they post the local bestseller list? I can't find it (only got foreign bestsellers and Malay bestseller etc.) No local writer's bestseller list? Xeus, as far as I know there is no local writer's bestseller's list. They're all lumped with books from the rest of the world. Hi! I think it's true that which genre ( Fiction or NOn) your title falls into can make a difference. But in Popular, it was best-seller under Fiction (? ), together with all the mat salleh best-sellers (see my website). In all honesty, I wasn't able to find out how many copies sold in a week to be named BS. Frankly, in comparison with MPH, Kino didn't layan me much when I tried to ask for figures. " Sorry, can't reveal the numbers, " when I called on the phone to ask what the stock was for my title. Maybe because I didn't say I'm the author. Local books, if you want to compare with int'nal BS, a bit susah laaa.. When Tash's book came, with so much hype, of course his books sold like hot cakes. It has all to do with publicity and the fact that it is int'nal BS. But that has season. Ask Rodney. Whatever naysayers say, about a title being a hot-for-the-moment thingy or not, if you can hit it off when it first comes out, it's better than never to hit it ever, betul? It helps if she's your friend laa...Some are very reticent to reveal figures, believe me. I knew of one who told me he took in 100 but actually only 50. I found out from my distributor later. This is called, "Si ai bin". In his store, my books were sold out and took damn long time to be replenished. You know why? The distributor refused to give his outlet books because he didn't pay on time!!!! I was damn sore because his outlet has one of the higher traffic, tourists' place but unfortunately, ppl couldn't buy there. The lesson here is, book selling involves too many 'moving parts'. There must be synergy from all parties, author's gungho attitude, active distribution, retailers who are active in paying the distributors on time,in order to get their stock, the display effort in stores, the promotions by 1)author 2) publisher 3)stores 4) media.....oh, yes, one more, I personally believe that book cover is VERY VERY important. If at first sight it turns me off at the store, then can "ki hor lan liao"! ( This is not to say that my TSIC cover is soooo great laa. Really, I'm still trying to get my dream artist to do my second book cover, if my publisher allows). PS, MPH I U, poster of BSL is at Entrance 1, behind the pillar. Ask Rodney or his staff laa. Aiyo Yvonne, very good postlah. Can I post this on my next blog or not? Very useful reading! For my book, I was told they also almost sold out the 3000 1st print run copies already in 1 month. But like you, this is from distributor to bookstore, we don't know how many from bookstore to readers. I only know how to check the MPH computers for stock. E.g: I know I sold 41 copies in 1 Utama last month. For those that don't display leftover stock, like Kino or Borders, I very shylah to ask counter. Incredibly gripping stories I must say !! !